Join the City of Unley and the Confucius Institute at the University of Adelaide to celebrate United Nations Chinese Language Day on Friday 12 April. From 4pm, the Village Green will come alive with free activities for kids, authentic food, live music, and the family favourite “Kung Fu Panda 3” screened at sunset (approx. 6.15pm). Note capacity is limited, please arrive early to avoid disappointment. For event details phone 8372 5111. 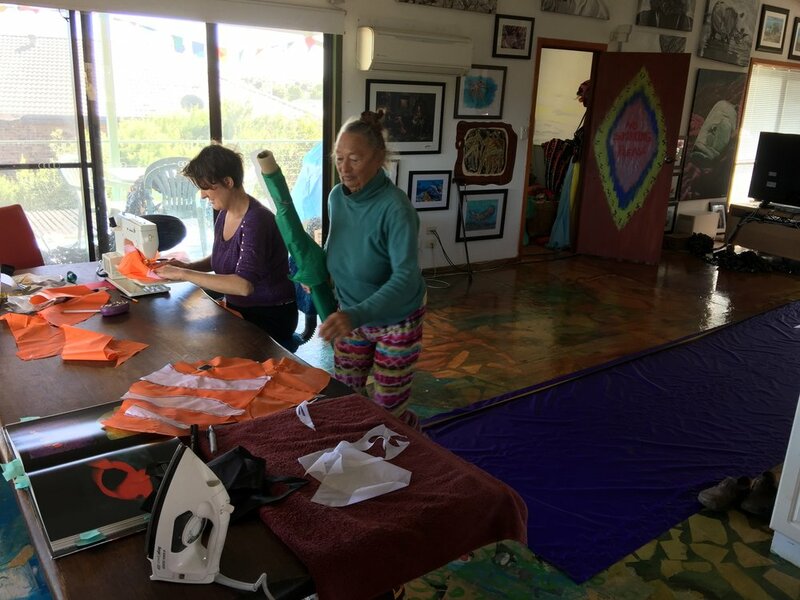 Evelyn has 6 inflatables up at the amazing Yabarra - Gathering of Light along Karrawirra Parri. A story for the senses, as projected light and sound guide you through an interactive cultural landscape, sharing stories of Kaurna country along Tarndaparri (the original name for the River Torrens). Listen to the sounds of the ever-changing landscape. The seasonal sounds of nature and culture will guide your movement through the six seasons of time. Wait patiently, sit respectfully, and observe the seasonal stories come alive as they change in a sea of colour and sound. Come add your story through the touch of your hand. Help create a wall of dreaming hands and see them come to life in this interactive projection artwork. Water and light combine to share stories of how the animals and fishermen of Tarndaparri once lived together in harmony. Everything is connected land, sea and sky countries are all one. Look up for the native birds on the river banks, how many birds can you find? Proud spirit custodians look out over Yabarra and the country. They share knowledge through cultural ways of understanding. A story will bring to life the heart of each native animal sitting along Tarndaparri – Torrens River and share their connection to the river. Learn their names, share their stories. It’s time for a parade! Evelyn is bringing an echidna to the Gardens so get ready to don a costume, be part of the parade of animals, before climbing into the belly of the echidna for a story. It was a beautiful sunny day spent at Red Poles cafe/gallery/B & B with our wonderful niece Angie, her partner Remy, two energetic sons Ryder and Hunter, and some lovely friends. Even adults dress up in our colourful capes. Lovely Saffron spent some time with me on Saturday painting a puffer fish as a new addition to the fish hats collection. 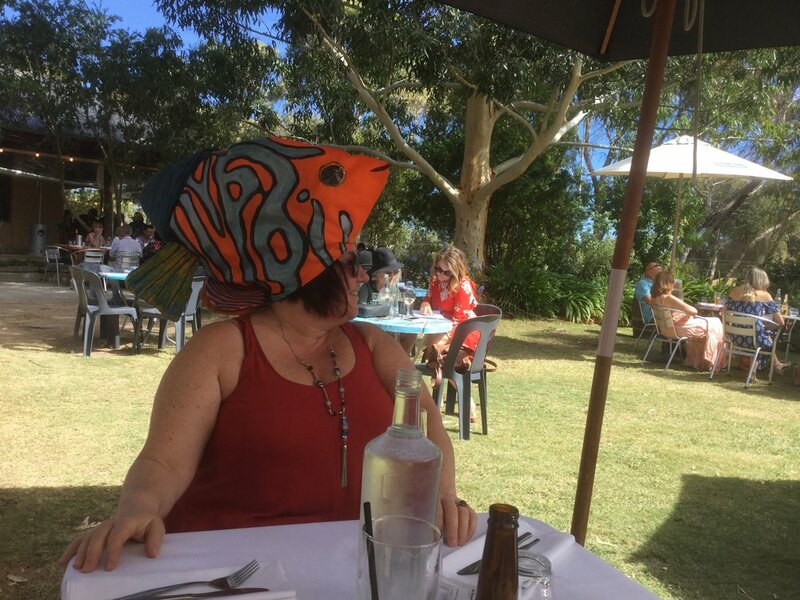 The fish hats were such a big hit in Kauai, Hawaii this past July, and also at this years Womadelaide world music festival in South Australia.